That's great news about Noesis - and it sounds like you've done a power of work in a short space of time. I'll check it myself later but I was pretty sure using MD3s would make things look (even) better. The quality difference is, indeed, striking. But, again, there are errors in my commit that I need to sort out. so don't be shocked if you see some weird stuff here and there. I made a dent in that late last night (not yet committed), and should have the rest dealt with by the end of tonight. Now that Noesis is working correctly, this unlocks even more power for us insomuch as including animated models. I've already gone through some of the older models in Paranoid and updated them. 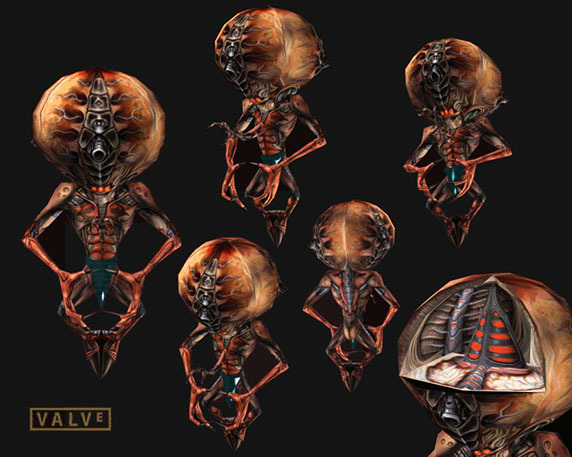 I'd like to ask about the origins of a couple of models that don't seem to be from Half-Life, in case there's room for me to update those as well. Off the top of my head, I'd like to ask about The Controller's model (military.md2, euro2.png). If anyone can give me details on the original source, I'd like to see if there's anything I can add. I could be wrong but I think that model was cobbled together from models in one of Willem Sitters' model packs. From the pictures on his site it looks like it was probably model pack 15. We needed a model to be the controller for cutscenes but it didn't need to do anything fancy so using one of Willem's static models as a base fit the bill at the time. So there probably isn't much more that can be done with that one. Alright, that's fair. Still, good to know the original source. Never hurts to have details. Thanks! But, before that, a simple question: is anyone vehemently opposed to swapping out the existing model? If that's the case, I'll skip the idea entirely. Adding some animation isn't worth causing an upset. If the replacement model looks nothing like the H-L Controller (or is a bad substitute) then I vote against it, even if it means the animation is not ideal. The Controller, like the Head Crab and the Vortigaunt, is an iconic character in H-L, and using a knock-off will detract from the authenticity we've striven for. Enjay said above that he was a custom model put together from static items made by Willem Sitters, so would not be authentic to Half-Life at all. Aside from not being animated, he already looks a little out of place compared to Half-Life; this is even more obvious when he is seen from inside the freezer, talking to a scientist. That being said, I have found a couple of potential candidates for replacements that don't look terribly dissimilar, so after I spend some time manipulating them, I can post some images to get thoughts and opinions from the team. Dear lord nooooooooooo you cannot change the controller. OK, I'm fine with it. Seriously, the controller was just cobbled together. We needed a model and that's the best I could come up with. I also screenshotted him for the comms mugshot. As long as it's a military type kind of guy that looks vaguely like the one we have (and reasonably consistent with other characters) I don't see a problem with replacing it. Ah, that would explain the confusion. Yes, this alien creature is known as a Controller, but the man giving orders to Dr. Bellmer, working for the European Space Consortium, is only referred to in-game as "The Controller". As he was the focus of our discussion already, I didn't realize a need to clarify which character I meant. I know HintMan was made with what resources you had at the time, and I do feel he fits his purpose just fine. However, I'm currently putting in a new replacement character that I feel will prove to be a worthy successor. Naturally, feedback and suggestions are always welcome. I'll post again once I've finished implementing him; basically all I need to do now is to tweak his sitting animation to fit that desk (or tweak the desk if I need to), though I may take a quick coffee/errand break before I'm ready to upload him. And he's in! You can now see him in all the normal places: The title map, the briefing at the start of MAP01, and through the window in the freezer on MAP15. I haven't replaced his icon to accompany incoming messages, yet. I'm actually wondering about ways I can make that a little more interesting. Perhaps placing him in a small room on each map and using a camera feed to broadcast him? Can't check the game right now but animating the HintMan image (either by camera or by a loop of individual pictures) would increase the interest factor IMO. But you'd have to be a certain age and from the UK for that one to really strike a chord I guess. Aside from not being animated, he already looks a little out of place compared to Half-Life; this is even more obvious when he is seen from inside the freezer, talking to a scientist. My apologies. I thought you were talking about the Xen creature named "Controller" by Valve, the game creators. As for the player's Controller (or 'Control', as in so many spy movies), there is no reason to use a model that resembles the original from Paranoid; this Controller doesn't exist in H-L. Feel free to use any similar model that you can easily animate. in fact, the static NPC models in the room next to the freezer look kind of odd, but there was nothing that we could have done about it a few months ago. Again, my mistake for the misunderstanding. Perfectly alright. And on the topic of that creature, I would not replace his model unless I found a good one from the set I prefer to go to; The 'Ultra-Definition' series of fan-made models. I've seen a few attempts for this creature, but they frankly look a bit poor to me. Valve/Gearbox did not include him in the High-Definition model set, so we're using the originals from the first release of Half-Life, for now. Incidentally, I have occasionally thought about what we might do in the event that we had to remove copyrighted materials. It would be a massive undertaking, certainly, but I'd rather see the mod repainted with something legally safe than to completely trash the whole thing. But we can cross that bridge if it ever happens to exist. That would be the only real case where I'd replace a monster with 'something similar'.